The Center for the Study of Social Policy (CSSP) supported the development of a Training of Trainers (TOT) curriculum co-created by the National Resource Center for Youth Services (NRCYS) and the Academy for Competent Youth Work. The Academy offers this curriculum in collaboration with CSSP as part of the Youth Thrive Training Collaborative (YTTC) that includes the Academy, Bolster Collaborative, Phillips Programs, and Youth Catalytics. Working with our collaboration partners, the YTTC provides the Youth Thrive TOT Course nationally and is one of the only providers of Youth Thrive Training for Trainers. The TOT curriculum presents the Youth Thrive™ protective and promotive factors framework and the research on which it is based in an understandable and useable format in a four day training (24 hours total). TOT participants become trainers who, in turn, use the material to train direct service staff and other practitioners, supervisors, program operators and managers. Context and information on current ideas, best practices and trends in adolescent development. Activities that allow participants to experience and explore the use of new concepts. Reflective exercises to think through how to integrate new ideas into existing programs and practices. Trainer’s Guide – Detailed, step-by-step curriculum guide for each of the seven modules that includes: learning goals, information on content, sequencing, timing, activities, materials needed and general facilitation instructions (168 pages). Participant Manual – Description of key concepts, activity worksheets and resources for participants in future trainings (70 pages). PowerPoint slides for each module (over 200 slides). Bibliography and Resource lists – A wealth of additional information for those who want to explore Youth Thrive™ concepts and research in greater depth. Feedback from Youth Thrive™ trainers – Opportunity to present parts of the curriculum and receive feedback from experienced Youth Thrive™ trainers during the TOT; membership in a community of practice to access additional feedback, virtual coaching and resources via phone contact and/or webinars to share ideas and information and to troubleshoot problems with other Youth Thrive™ trainers. Major responsibility for leading and delivering training as part of their work assignment for at least 2 years. Proficient in more than one training curriculum or major content area. Values and perspectives that are compatible with the Youth Thrive™ framework. 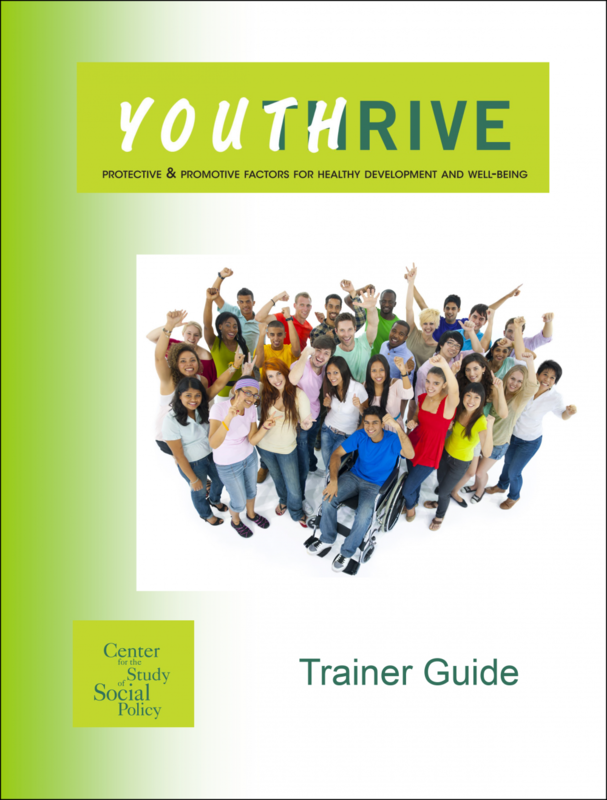 Because the Youth Thrive™ training curriculum contains demanding content, we see it as a resource for experienced trainers who have the skills, competencies, commitment and opportunity to provide the training to a significant number of workers and staff. This is not the right opportunity for novice trainers or individuals who are interested in an initial orientation to the Youth Thrive™ framework. An introductory experience is better obtained by reading the Youth Thrive materials or by participating in Youth Thrive™ conference presentations or workshops. We strongly encourage and support the participation of young adults in the Youth Thrive™ TOT, especially those who have had experience in the child welfare or other service systems. Youth voices and perspectives are enormously beneficial to all aspects of Youth Thrive™ work. Ideally, youth who participate should have already engaged in other training, leadership development or advocacy activities (e.g., Youth Advisory Boards, student government, community service) and who can partner with a staff trainer to conduct training sessions. Depending on the specific situation, it may also be appropriate for youth, especially young leaders and advocates, to participate in the Youth Thrive™ practitioner training. Provide Youth Thrive™ training by conducting at least two practitioner trainings reaching approximately 50 individuals who have direct contact with youth over the two years following completion of the Youth Thrive™ Training of Trainers course. Submit basic contact information for all practitioners trained and session evaluations to the Youth Thrive™ training data base maintained by NRCYS so we can track training impact. Participate in periodic conference calls or webinars to share information, strategies and plans, and receive virtual coaching and resource updates. The Training of Trainers (TOT) is an intensive training that typically takes four, consecutive, full days (a total of 24 hours). The TOT includes a full presentation of the Youth Thrive™ framework and guiding premises taught by experienced trainers. The final day of the training allows participants to receive training in adult learning principles, methods for increasing participant use of the course concepts, ‘teach back’ sections of modules, explore using the course materials, receive feedback from TOT course instructors and participants, and develop a plan for how to implement the Youth Thrive™ training. This format allows participants time to explore the five protective and promotive factors, current ‘best practices’ relating to self-awareness, self-care, the impact of trauma on adolescent development, assets and strengths-based youth development approaches, relational youth work, and culturally responsive services. Time is allowed for discussion, thinking through implications, and reflecting on how to integrate the Youth Thrive™ concepts into current practices. Scheduling is typically three, 6-hour days held back-to-back. The Youth Thrive™ training is organized into seven modules. Each module can be presented as a stand-alone session or further subdivided into smaller time increments. These can be scheduled on successive days or over a period of weeks as part of an on-going staff development program. CSSP recommends that when the content is sub-divided, adequate time be included to review previously presented material to help participants inter-connect concepts and bridge content between sessions. This typically means that when the training is subdivided, total presentation time is increased.